“Bada has been in HiFi business for 25 years, delivering value for money products with absolutely no compromise in design & quality. Branded international parts are used inside all BADA products. Our era of rapid development in technology brings a serious disturbance to the power grid. It greatly interferes our precious audio visual equipment, making the quality suffered. – A design of 2 way, 2 sets of individual independant filtering power supply, 2 On/Off switches for more practical and convenient operation. – 2 groups of toroidal filtering elements, 8 sets of red Wima-MKP10 filtering capacitors. – Won pro recepticles, 12 AWG high purity solid core copper for maximum transmission, speedy energy supply. Features Professional grade Wonpro outlet socket, WIMA Caps, wiring of great industrial cable 500V section of 2.5 sqmm for a guaranteed excellent result. Heavy duty aluminum alloy chassis. Pentagon OCC conductor (Bada’s patented technology), increased surface for improved mid high frequencies. – Power AC Purifying and Conditioning. – Power Surge / Lighting Surge protection. *Circuit breaker / not fuse based. *Detachable power cord for more flexibility, user may upgrade to other OFC power cord for more improvement in future. Power AC noise tested with ENTECH wideband powerline noise analyzer. – A direct wall outlet shows 58.5 units of grid disturbance interference (AC noise). – With the LB-5500 put on, the noise tester shows a bare filtering residual value of 1 !! This is a simple demo of the noisy dirty electrical pollution and how effective a power conditioner in dealing with them. Dirty electricity is electromagnetic pollution (EMI or RFI) that’s created by many electrical devices and is caused by interruptions in the flow of normal current. NEW 2017 Facelife Model Price: RM665 nett. 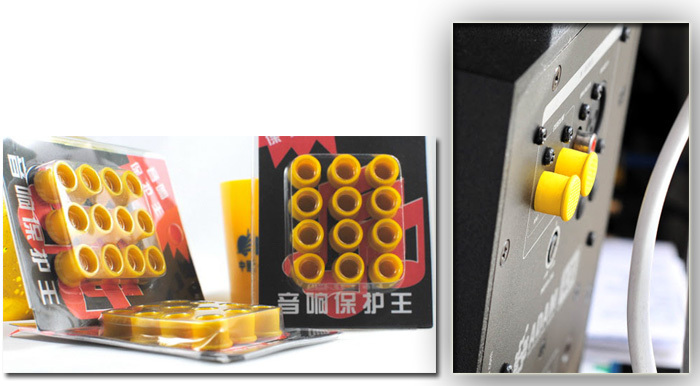 FREE GIFTS of i) RCA Protective Caps of 12pcs! This entry was posted in Power Conditioners. Bookmark the permalink.